I don't know about you, but some of my best insights come in the shower. I'm not exactly sure why that is, but I would opine that during this season of my life, the shower is about the only place in my home where I can escape from my ever-curious toddler. Something about changing diapers, watching PBS Kids, playing with toys, and reading stories to a baby doesn't leave much room for deep contemplation and introspection. During my Monday morning shower I had another one of those 'aha' kind of moments. Every Monday night we host a student-led worship and prayer service at the youth center where I work and often I am in charge of leading the music for that event. In the midst of my warmth-induced shower coma, I suddenly had a an idea about how I might lead the students in worship and prayer that evening - I would use the themes from our songs to lead us into intentional times of prayer. I began by choosing six songs that all had a certain theme that I wanted us to pray about. Then, during our actual time of worship that evening, we would sing a song and then follow that by breaking into small groups to pray over the theme that the song had just addressed. For example, I began by playing the song "Your Grace is Enough" and then we broke into groups to thank God for God's incredible grace and forgiveness in our lives. We went on to sing five more songs, focusing on the themes of love, God's strength and greatness, God's intimate and personal nature, following Jesus through discipleship, and serving the world through justice. I didn't know how this idea would work and whether the students would enjoy the process, but it worked great and they LOVED it. And I did too. It was a lot of fun and was a really meaningful way of worshiping and praying. I look forward to making this idea a consistent part of these student gatherings, and may even try it with our church in a Sunday worship service. 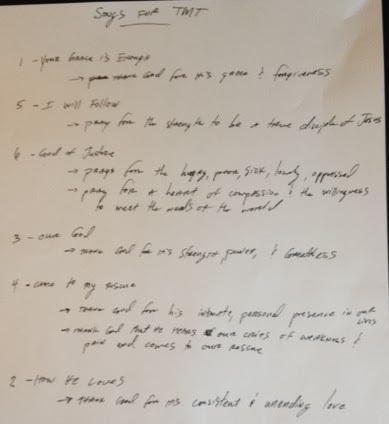 The picture below is my rough outline of the songs I chose and the themes we explored in prayer. I think I'll call this form of worship and prayer "Musical Prayers" (see what I did there?!? ).